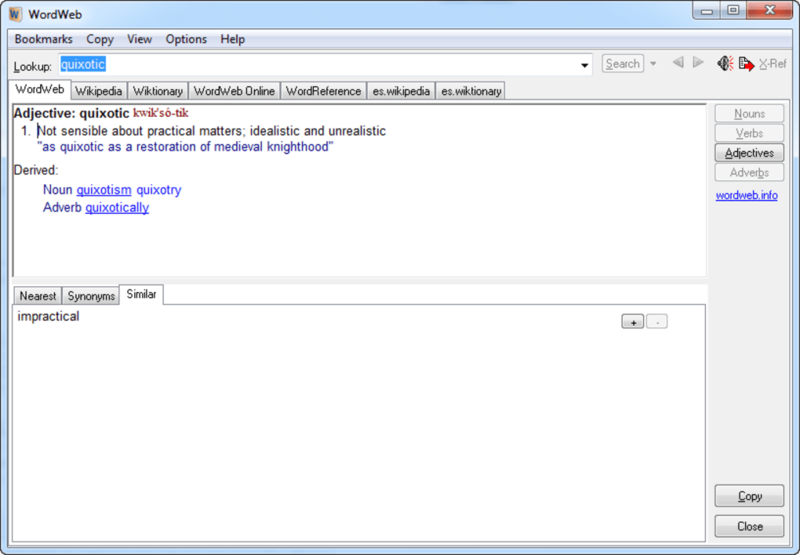 WordWeb sames you time by putting a full dictionary at your fingertips. Luckily there’s a whole batch of lexicon applications that’ll send it back to the shelf (or in the trash can) forever. 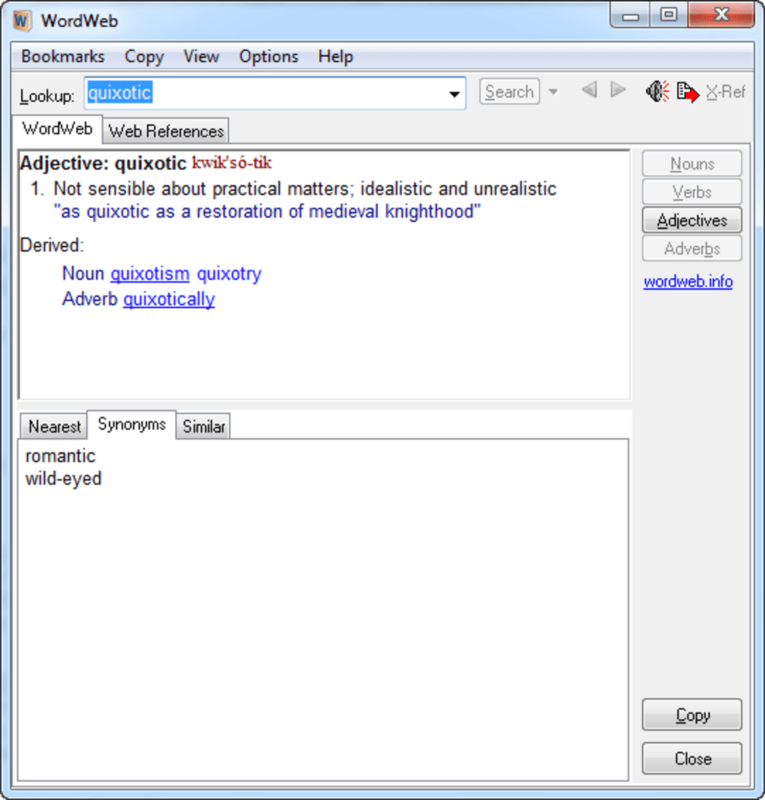 WordWeb is the perfect example of this type of dictionary and thesaurus combo in a hands-on interface. What you’re looking for in a dictionary application is something you can open in a click, paste your word, and immediately get the results. You get that in Wordweb via system tray integration, and a Ctrl+Alt+W hot key combination. On install WordWeb will ask you the English locale you will use, such as Australian, Canadian American or New Zealander. The program keeps a history of your searches and you can quickly access them via the side arrows. You can refine your search by selecting word categories like nouns, verbs, adjectives and adverbs and decide to show pronunciation, usage and offensive or vulgar words. 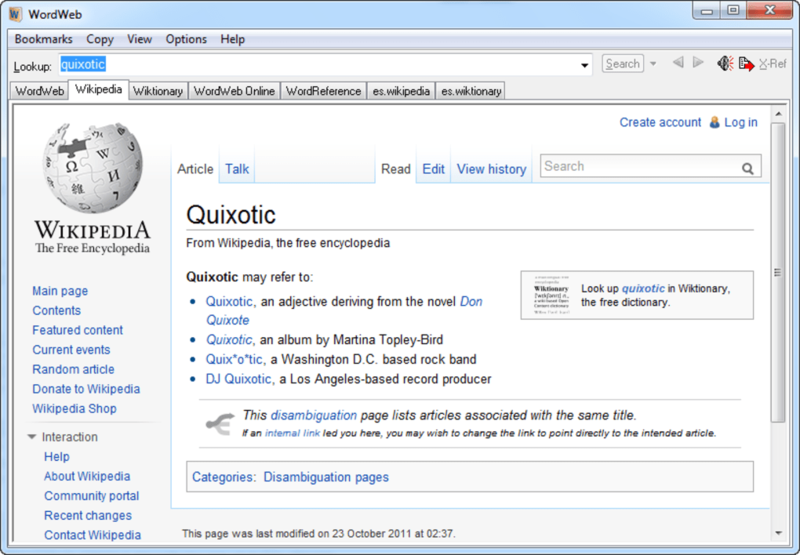 WordWeb isn’t associated to any world famous reliable dictionary like Webster’s, preferring its very own online source, comprising of more than 240,000 words and updated regularly, according to the developer. 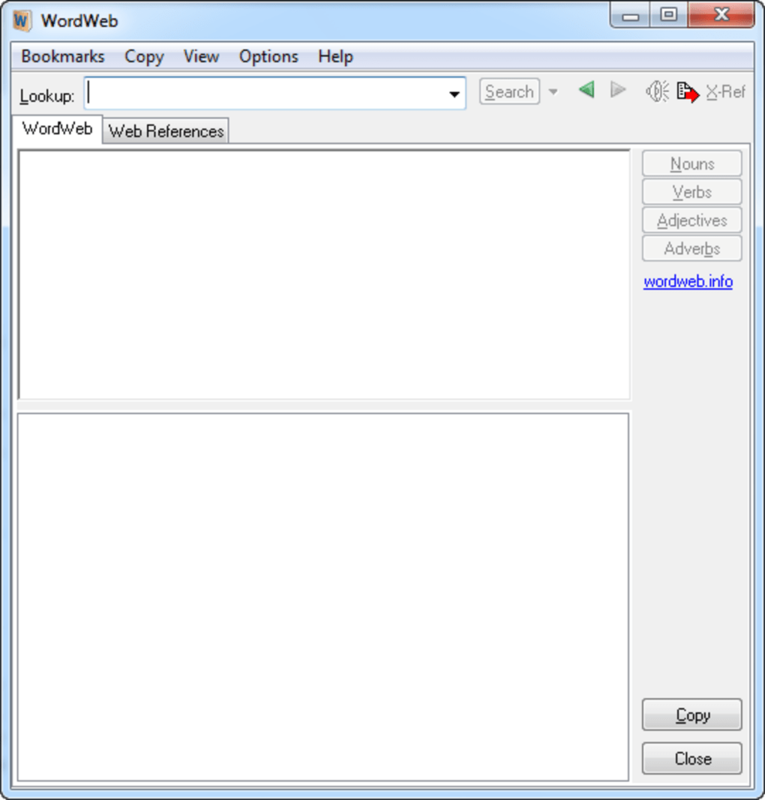 WordWeb is a reliable dictionary and thesaurus with a simple, hands-on approach. It is an ideal partner to fight off writer’s block and improve your vocabulary. The online dictionary is a rich source and WordWeb should help you out of any mind jam whenever you’re writing an article. WordWeb dictionary is so unique. It will assist me in doing my studies because its unique and well written. Pros: Translation of te meaning of words. I'm a 'picky' kind of guy and want to get it 'right the first time'.. I have been using Wordweb for two years now and am satisfied. I'm a picky sort of guy as I have to be. You see, i,m an author quickly on his way to having his 2nd novel 'out there'. Wordweb is a must have for anyone wanting to 'get it right' the first time. Oh. It's free too by the way. Kwelio Largo. The fact that it's made all so easy from the word - GO! Love Wordweb it is my most valuable tool on my P.C.. I just love this tool...it is the most important part of my everyday use on my P.C. However, I have been having trouble in the last couple of days, losing the w icon on the bottom of the computer, I have to keep on downloading wordweb again..Do you for know for what reason this could be happening? I would like to get to the bottom of the problem, it has only just started. Thank you so much for my most important tool.. I would appreciate some feedback, thank you. What do you think about WordWeb? Do you recommend it? Why?